Thank you to The Straits Times and Lee Mun Wai for this glowing review of She Ain’t Heavy, She’s Reaching into Space in the life section today! 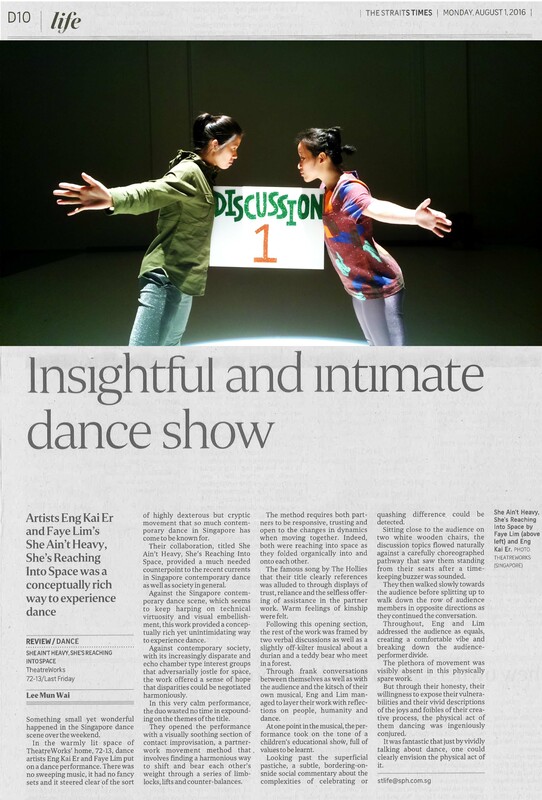 “She Ain’t Heavy, She Reaching into Space, provided a much needed counterpoint to the recents currents in Singapore contemporary dance as well as society in general”. Thank you to everyone who came to watch this performance! We have started tickets sale for our next production, ‘GALA’ in October. Get your tickets from SISTIC! 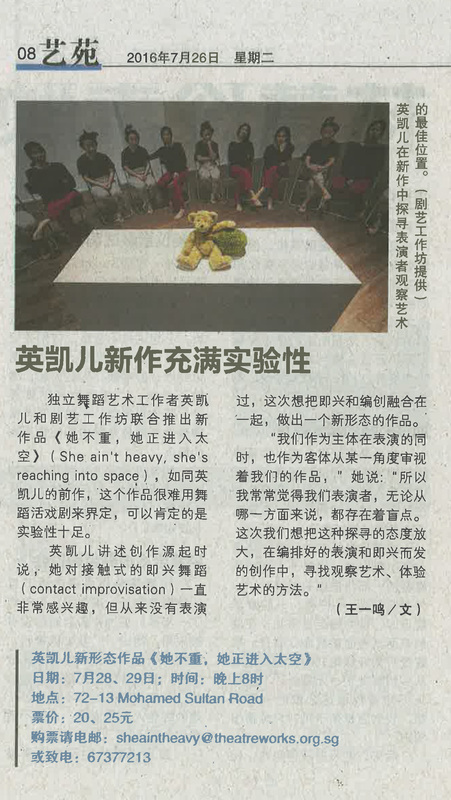 ‘She Ain’t Heavy, She’s Reaching into Space’ featured in Lianhe ZaoBao! Our associate artist, Eng Kai Er in collaboration with Faye Lim, have been working hard the past weeks on their performance She Ain’t Heavy, She’s Reaching into Space. Today, they were featured in LianHe Zaobao. Initially starting off as a piece of contact improvisation, their performance has evolved, moving away from just Contact Improvisation, into what Kai hopes to be a new type of art form -a blend of improvisation, rehearsal and dance. Independent Dancer Eng Kai Er and TheatreWorks are working together to present her latest work, She Ain’t Heavy, She’s Reaching into Space. Just like her previous works, Eng Kai Er’s latest presentation cannot be classified under the genre of dance theatre, but one thing is for sure– it is filled with experimentation and unconventionality. When Kai spoke of where the idea for this production stemmed from, she attributed a large part of it to her prolonged interest in contact improvisation, but the lack of opportunity to bring it into her performance. She hopes that this performance will serve as platform to blend improvisation and rehearsal, and hopefully, to emerge as a new type of art form. But exactly how real do the discussions get? We hope you’ll come down and see it for yourself. Happening at 8pm, on 28-29 July 2016 at 72-13! Do email us at sheaintheavy@theatreworks.org.sg or call us at 6737-7213 to get tickets today! We’ve spoken about She Ain’t Heavy, She’s Reaching into Space enough — it’s time for you to have a listen. As Kai and Faye explore the integral role of discussion in collaborative performance-making, they run into a series of both fortunate and unfortunate events… But wait- do the technical elements and concepts of the show sound intimidating, or maybe even unfamiliar to you? The soundtrack’s just the tip of the iceberg — We’re less than a week away, and we’ve still got a couple of tickets left to the two shows, so don’t miss out on an adventure full of ups, downs, twists and turns! “She Ain’t Heavy, She’s Reaching into Space” was featured in The Business Times today! 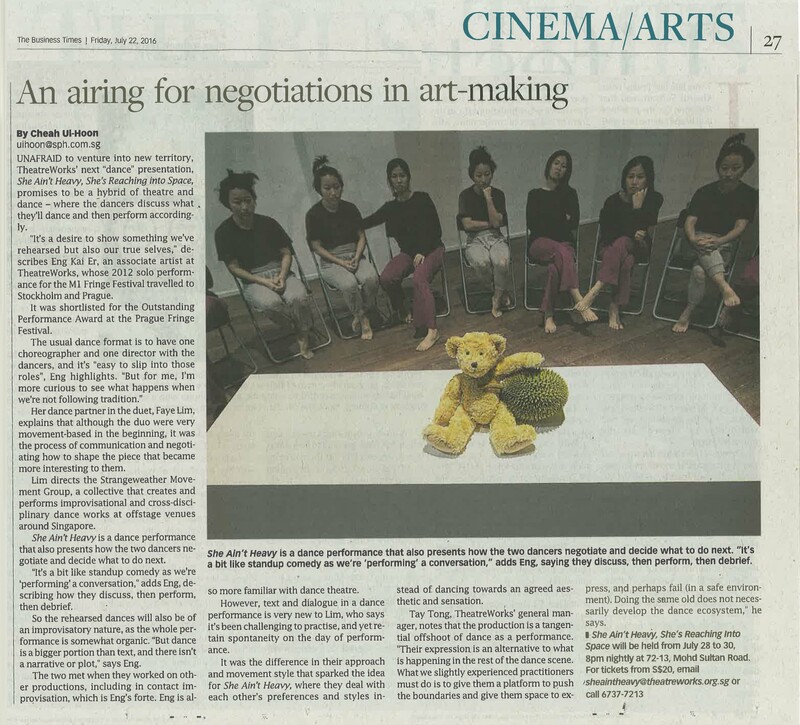 ‘‘She Ain’t Heavy, She’s Reaching into Space’ by our associate artist, Eng Kai Er in collaboration with Faye Lim, was featured in The Business Times today! Breaking free from conventional dance format to present an alternative yet authentic dance, the duo shares about the more abstract elements in their performance. Our associate artist scheme aims to develop and nurture artist, providing them a platform to push the boundaries and to express themselves in a safe space. And as our Managing Director, Tay Tong so nicely summed up, “Doing the same old does not necessarily develop the dance ecosystem”. Take a chance, and join us for this alternative and quirky performance, from 28-29 July 2016 at 72-13! Email us at sheaintheavy@theatreworks.org.sg or call us at 6737-7213.